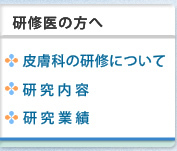 Mizawa M, Makino T, Nakano H, Sawamura D, Shimizu T.: Erythropoietic protoporphyria in a Japanese population. Takemoto K, Makino T, Mizawa M, Kubo Y, Shimizu T.: Detection of a missense mutation Y449H of the K10 gene in a patient with a severe phenotype of epidermolytic ichthyosis. Shimizu K, Andoh T, Makino T, Yoshihisa Y, Mizawa M, Shimizu T.: The grade of itching in mycosis fungoides is correlated with the increase of eosinophil infiltration and kallikrein 5 expression: the mechanisms of itching in mycosis fungoides. Makino T, Mizawa M, Yoshihisa Y, Shimizu T.: Ultraviolet B irradiation increases the expression of trichohyalin-like 1 protein in human skin xenotransplants. 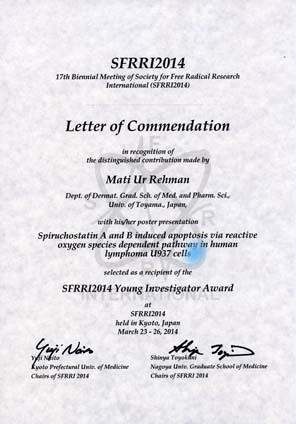 Makino T & Shimizu T.: Review article: Fibrillar-type dermatitis herpetiformis. Kagoyama K, Andoh T, Shimizu T.: Enlarging the irradiation spot to include the edge of hyperkeratotic papules using a CO2 surgical laser dramatically and effectively treats lichen amyloidosis. Yoshihisa Y, Rehman MU, Nakagawa M, Matsukuma S, Makino T, Mori H, Shimizu T.:Inflammatory cytokine-mediated induction of serine racemase in atopic dermatitis. J Cell Mol Med. 22: 3133-3138, 2018. Torai R, Makino T, Mizawa M, Shimomura Y, Shimizu T.:A novel missense mutation in exon 3 of the TRPS1 gene in a patient with a mild phenotype of tricho-rhino-phalangeal syndrome type 1. Eur J Dermatol. 1;28(2):271-272, 2018. Yanagihara M, Makino T, Shimizu T, Mochizuki T.: Nerve alterations showing autophagy in two patients with lichen aureus. J Cutan Pathol. 45(6):423-427, 2018. 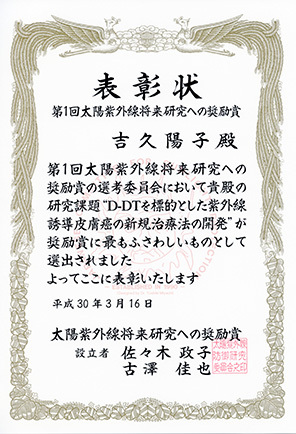 Kurosaki Y, Suga Y, Negi O, Takamori K, Ishii N, Makino T, Shimizu T, Hashimoto T.: Monitoring of IgA antibodies to epidermal and tissue transglutaminases over an 18-month period in a Japanese patient with dermatitis herpetiformis. Mizawa M, Makino T, Hayashi M, Furukawa F, Shimizu T.:Lichen planus pemphigoides with palmoplantar hyperkeratosis. Torai R, Makino T, Mizawa M, Hayashi M, Furukawa F, Niimi H, Shimizu T.:Recurrent deep vein thrombosis with a protein S Tokushima mutation. Br J Dermatol. 178 :e7-e8,2018. Furukawa F, Mizawa M, Makino T, Torai R, Shimizu T.:Efficacy of new low-dose oral anticoagulants in recalcitrant livedoid vasculopathy. BMJ Case Rep 2017. Jul 24;2017. Watanabe S, Ohnishi T, Yuasa A, Kiyota H, Iwata S, Kaku M, Watanabe A, Sato J, Hanaki H, Manabe M, Suzuki T, Otsuka F, Aihara M, Iozumi K, Tamaki T, Funada Y, Shinozaki M, Kobayashi M, Okuda M, Kikyo G, Kikuchi K, Okada Y, Takeshima M, Kaneko O, Ogawa N, Ito R, Okuyama R, Shimada S, Shimizu T, Hatta N, Manabu M, Tsutsui K, Tanaka T, Miyachi Y, Asada H, Furukawa F, Kurokawa I, Iwatsuki K, Hide M, Muto M, Yamamoto O, Niihara H, Takagaki K, Kubota Y, Sayama K, Sano S, Furue M, Kanekura T.: The first nationwide surveillance of antibacterial susceptibility patterns of pathogens isolated from skin and soft-tissue infections in dermatology departments in Japan. 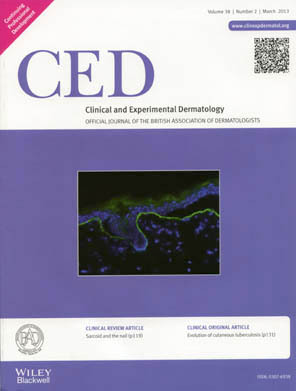 Makino T, Yoshihisa Y, Mizawa M, Tsutsui K, Nishijima C, Inaoki M, Shimizu T.: Increased serum levels of Th2-type cytokines and eotaxin in fibrillar-type dermatitis herpetiformis. Acta Derm Venereol. 97(5):642-643, 2017. Andoh T, Shimizu T.: Increase in sensory sensitivity around, but not in the central part of, the hyperkeratotic papule in lichen amyloidosis. Makino T, Hara H, Mizawa M, Shimizu A, Kaira K, Shimizu T.: Detection of human papillomavirus type 35 in recurrent Bowen's disease lesions of the fingers. Makino T, Ishida W, Hamashima T, Mizawa M, Sasahara M, Shimizu T.: An intermediate vascular tumour between kaposiform hemangioendothelioma and tufted angioma with regression of the skin lesion. Eur J Dermatol., Apr 1;27(2):175-176, 2017. Mizawa M, Makino T, Furukawa F, Torai R, Nakano H, Sawamura D, Shimizu T.: The 6-year follow-up of a Japanese patient with silent erythropoietic protoporphyria. JAAD Case Rep., 3:169-171, 2017. Yoshihisa Y, Rehman MU, Kondo T, Shimizu T.: Role of macrophage migration inhibitory factor in heat-induced apoptosis in keratinocytes. Sugita Y, Makino T, Mizawa M, Shimizu T.: Mugwort-mustard allergy syndrome due to broccoli consumption. Case Rep Dermatol Med., 2016:8413767, 2016. Rehman MU, Jawaid P, Zhao QL, Li P, Narita K, Katoh T, Shimizu T, Kondo T.:Low-dose spiruchostatin-B, a potent histone deacetylase inhibitor enhances radiation-induced apoptosis in human lymphoma U937 cells via modulation of redox signaling. Jawaid P, Rehman MU, Zhao QL, Takeda K, Ishikawa K, Hori M, Shimizu T, Kondo T.: Helium-based cold atmospheric plasma-induced reactive oxygen species-mediated apoptotic pathway attenuated by platinum nanoparticles. J Cell Mol Med., 20(9):1737-48,2016. Winge MC, Ohyama B, Dey CN, Boxer LM, Li W, Ehsani-Chimeh N, Truong AK, Wu D, Armstrong AW, Makino T, Davidson M, Starcevic D, Kislat A, Nguyen NT, Hashimoto T, Homey B, Khavari PA, Bradley M, Waterman EA, Marinkovich MP. : RAC1 activation drives pathologic interactions between the epidermis and immune cells. J Clin Invest., 2016 Jul 1;126(7):2661-77. Mizawa M, Makino T, Inami C, Shimizu T.: Jumi-haidoku-to (Shi-Wei-Ba-Du-Tang), a Kampo Formula, ecreases the disease activity of palmoplantar pustulosis. Dermatol Res Pract., 2016: 4060673,2016. Makino T, Mizawa M, Seki Y, Hayashi M, Shimizu T.: Decreased filaggrin-2 expression in the epidermis in a case of pityriasis rotunda. Mizawa M, Makino T, Nakano H, Sawamura D, Shimizu T.: Incomplete erythropoietic protoporphyria caused by a splice site modulator homozygous IVS3-48C polymorphism in the ferrochelatase gene. Br J Dermatol., 174:172-175, 2016. Jawaid P, Rehman MU, Hassan MH, Zhao QL, Li P, Miyamoto Y, Misawa M, Ogawa R, Shimizu T, Kondo T.: Effect of Platinum Nanoparticles on Cell Death Induced. Ultrasound in Human Lymphoma U937 Cells. Makino T, Shimizu T.; The expression profile of filaggrin-2 in the normal and pathologic human oral mucosa. Arch Dermatol Res., 308(3):213-7, 2016. Makino T, Hara H, Hamashima T, Mizawa M, Seki Y, Hayashi H, Shimizu T.; Hodgkin lymphoma presenting as subcutaneous masses in the left upper arm. Yoshihisa Y, Andoh T, Matsunaga K, Shimizu T.; Efficacy of the astaxanthin for the treatment in a murine model of atopic dermatitis. Hara H, Makino T, Shimizu T.: Annular pustular psoriasis associated with colon cancer. Eur J Dermatol., 1;26(1):104-5, 2016. Makino T, Shimizu K, Mizawa M, Nakano H, Sawamura D, Shimizu T.: A novel deletion mutation of the ATP2C1 gene in a family with Hailey-Hailey disease. Mizawa M, Makino T, Nakamura T, Yamaguchi S, Taki H, Shimizu T.: Exacerbation of symptoms in Blau syndrome/early-onset sarcoidosis following delivery. Kagoyama K, Makino T, Ueda C, Takegami Y, Shimizu T.: Detection of cytomegalovirus in the gastric ulcer of a patient with drug-induced hypersensitivity syndrome. J Am Acad Derm Case Report., 215-218, 2015. Yoshihisa Y, Rehman MU, Yamakoshi-Shibutani T, Shimizu T.: In vitro effects of zinc on the cytokine production from peripheral blood mononuclear cells in patients with zinc allergy. Shimizu K, Andoh T, Yoshihisa Y, Shimizu T.: Histamine released from epidermal keratinocytes plays a role in α-melanocyte-stimulating hormone-induced itching in mice. Mori N, Makino T, Mizawa M, Kagoyama K, Kanegane H, Sakaguchi H, Miyazono T, Shimizu T.: Late presentation of X-linked dyskeratosis congenita with a missense mutation in codon 350 of the dyskerin protein. Eur J Dermatol., 25:75-76, 2015. Matsui K, Makino T, Mizawa M,Hamashima T, Hanakawa H, Hatta N, Sasahara M, Shimizu T.: Extramammary Paget’s disease arising from Cowden syndrome. Eur J Dermatol. , 25:89-91, 2015. Nagata Y, Yoshihisa Y, Rehman MU, Matsunaga K, Kitaichi N, Shimizu T.: Role of macrophage migration inhibitory factor (MIF) in pollen-induced allergic conjunctivitis and pollen dermatitis in mice. Makino T, Mori N, Sugiyama H, Mizawa M, Seki Y, Kagoyama K, Shimizu T.: Creeping eruption due to a larva of Spirurina type X.
Yasuda C, Enomoto E, Ishiwatari S, Mori N, Kagoyama K, Matsunaga K, Yoshihisa Y, Matsukuma S, Shimizu T.: Macrophage migration inhibitory factor (MIF) in the stratum corneum: A marker of the local severity of atopic dermatitis. Rehman MU, Jawaid P, Yoshihisa Y, Li P, Zhao QL, Narita K, Katoh T, Kondo T, Shimizu T.: Spiruchostatin A and B, novel histone deacetylase inhibitors, induce apoptosis through reactive oxygen species-mitochondria pathway in human lymphoma U937 Cells. Makino T, Mizawa M, Yamakoshi T, Takaishi M, Shimizu T.: Expression of filaggrin-2 protein in the epidermis of human skin diseases: A comparative analysis with filaggrin. Biochem Biophys Res Commun., 449: 100-106, 2014. Ishida H, Yasue Y, Hachiga T, Andoh T, Akiguchi S, Kuraishi Y, Shimizu T.: Power spectrum and blood flow velocity images obtained by dual-beam backscatter laser Doppler velocimetry. Opt Rev., 21: 461-467, 2014. Seki Y, Makino T, Mizawa M, Hamashima T, Sasahara M, Shimizu T.: Immunohistological examination of hand, foot and mouth disease caused by coxsackievirus A6. Eur J Dermatol., 24:506-507, 2014. Yamamoto-Tanaka M, Makino T, Motoyama A, Miyai M, Tsuboi R, Hibino T.: Multiple pathways are involved in DNA degradation during keratinocyte terminal differentiation. Cell Death Dis., 5:e1181, 2014. Shinoda K, Hayashi R, Taki H, Hounoki H, Makino T, Nomoto K, Shimizu T, Tobe K.: Pseudo-Behcet's disease associated with tuberculosis: a case report and review of the literature. Jawaid P, Rehman UM,Yoshihisa Y, Li P, Zhao QL, Hassan MA, Miyamoto Y, Shimizu T, Kondo T.: Effects of SOD/catalase mimetic platinum nanoparticles on radiation-induced apoptosis in human lymphoma U937 cells. Hara H, Makino T, Matsui K, Takegami Y, Koga H, Fukuda S, Ishii N, Hashimoto T, Shimizu T: Unusual bullous pemphigoid without infiltration of inflammatory cells in the skin lesions. Eur J Dermatol., 24:488-489, 2014. Mizawa M, Makino T, Norisugi O, Hara H, Shimizu K,Nomura K, Kanegane H, Nojima T, Shimizu T.: Primary cutaneous Ewing sarcoma following metastases of bone and lymph nodes. Br J Dermatol., 171:660-662, 2014. Yoshihisa Y, Norisugi O, Matsunaga K, Nishihira J, Shimizu T.:Involvement of MIF in Basement Membrane Damage in Chronically UVB- Exposed Skin in Mice. PLoS One 9: e89569, 2014. Yoshihisa Y, Rehman MU, Shimizu T.:Astaxanthin, a xanthophyll carotenoid, inhibits ultraviolet-induced apoptosis in keratinocytes. Mori N, Mizawa M, Hara H, Norisugi O, Nakano H, Sawamura D, Shimizu T.: Hailey-Hailey disease diagnosed by exacerbation of contact dermatitis with topical crotamiton. Eur J Dermatol., 24: 263-264, 2014. Matsui K, Makino T, Takegami Y, Murayama S, Seki Y, Ishii N, Hashimoto T, Shimizu T. :Bullous pemphigoid with IgG anti-LAD-1 antibodies. Eur J Dermatol., 24:275-276, 2014. 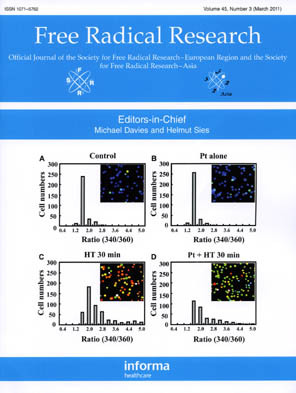 Inoue R, Yoshihisa Y, Tojo Y, Okamura C, Yoshida Y, Kishimoto J, Luan X, Watanabe M, Mizuguchi M, Nabeshima Y, Hamase K, Matsunaga K, Shimizu T, Mori H.: Localization of serine racemase and its role in the skin. J Invest Dermatol., 134: 1618-1626, 2014. Mori N, Makino T, Matsui K, Takegami Y Murayama S, Shimizu T.: Successful treatment with UVA rush hardening in a case of solar urticarial. Eur J Dermatol., 24:117-119, 2014. 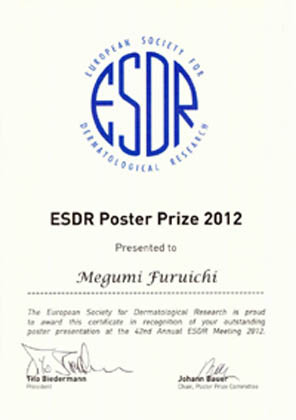 Makino T, Seki Y, Hara H, Mizawa M, Matsui K, Shimizu K, Shimizu T.: Induction of skin lesions by ultraviolet B irradiation in a case of pemphigus erythematosus. Acta Derma Venereol., 94:487-488, 2014. Norisugi O, Yamakoshi T, Shimizu T.: Successful treatment of lichen amyloidisis using CO2 surgical laser. 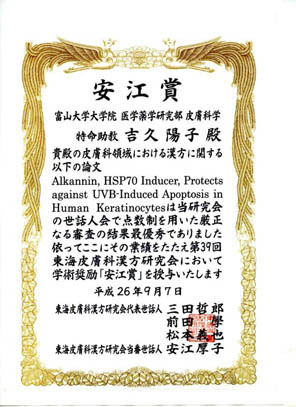 Makino T, Yamakoshi T, Mizawa M, Shimizu T.: Ultraviolet B irradiation induces the expression of hornerin in xenotransplanted human skin. Norisugi O, Yoshihisa Y, Shimizu K, Shimizu T.: In vitro cytokine expression by PBMCs in herbal drug-induced skin eruption. Acta Derma Venereol., 94:58-62, 2014.